Chapter 1: Introduction: why Yunnan? The Chinese Government’s five-year strategy for social and economic development to 2015 includes the aim of making the southwestern province of Yunnan a bridgehead for ‘opening the country’ to southeast Asia and south Asia. Yunnan - A Chinese Bridgehead to Asia traces the dynamic process which has led to this policy goal, a process through which Yunnan is being repositioned from a southwestern periphery of the People’s Republic of China to a ‘bridgehead’ between China and its regional neighbours. It shows how this has been expressed in ideas and policy frameworks, involvement in regional institutions, infrastructure development, and changing trade and investment flows, from the 1980s to the present. 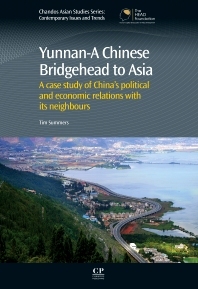 Detailing the wider context of the changes in China's global interactions, especially in Asia, the book uses Yunnan's case to demonstrate the extent of provincial agency in global interactions in reform-era China, and provides new insights into both China’s relationships with its Asian neighbours and the increasingly important economic engagement between developing countries. Tim Summers writes on the politics, economy, and international relations of contemporary China. He is a Senior Consulting Fellow with Chatham House in London, teaches at the Chinese University of Hong Kong (CUHK), and advises corporates and investors on China. Tim holds a PhD in Chinese Studies from CUHK, and an MA from the University of Cambridge. He was British Consul-General in Chongqing from 2004 to 2007, when he traveled extensively in southwest China, including in Yunnan.